I remember writing the review for Yousendit more than a year ago. Back then they were a fresh startup trying to make their mark in the file transfer industry. Today they have grown up and has released a plug-in tool for Microsoft Office. Yousendit is a simple way to send large files from point A to B without attaching the file to an email. Basically, users upload a large file to Yousendit, they store it for some time or indefinitely and they give you and the recipients a permalink where the file can be downloaded. Easy. Now they are making it easier with a Microsoft Office plug-in. The folks at Yousendit realized that most of the larger files sent via email attachment and even through their own service are Word documents, Excel spreadsheets and Powerpoint presentations. So to trump their competition, why not go to the source itself? The Yousendit plug-in once downloaded and installed, embeds itself in Microsoft Office. the plug-in is accessible under the Send option in the File tab. 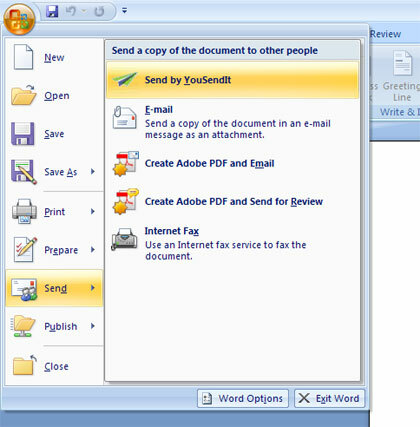 From there, users do not need to leave Microsoft office and can send the file directly to any email address using the Yousendit tool. Ingenius.